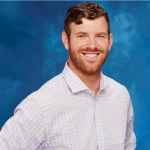 Chad from The Bachelorette is Scary! Okay I’m a really good mom. I don’t let my kids watch crap on TV. They’re 12 and 14. Their brains are still forming. 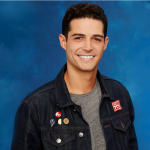 So imagine my horror when a friend came to visit, forced us at gunpoint to watch the season premiere of The Bachelorette and we all became addicted. When Chad threatened to beat up Alex we decided he might erupt into ‘Roid Rage at any moment. Keep your tongue to yourself, Chad!! You just know this guy is juicing! 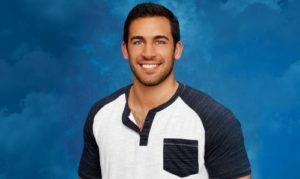 As the rose ceremony approached on episode two my daughters and I were outraged and transfixed by Chad’s inappropriate stalkage of bachelorette JoJo. Evan, just punch Chad in the nose and run as fast as you can! And the constant meat eating! He ate more meat on episode two than an African jackal on the Savannah! And who does shirtless pull-ups with their suitcase clamped between their inner thighs? Satan??? 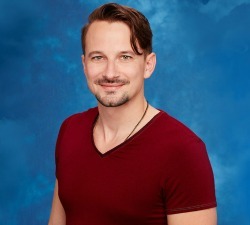 So imagine the suspense as sweet, perky JoJo gave away rose after rose to everyone except Chad. My daughters and I had sweaty hands as we waited to see whom JoJo would give the last rose. A thrilling fear and revulsion coursed through our veins as Chad ate cold baloney with his sharp predator teeth whilst skewering JoJo with a ravenous glare. Run JoJo, ruuuuunnnnnn. Remember, men who’re on steroids have very small penises! Finally JoJo had just one last rose to bequeath. A collective hush fell over our living room, the three of us glancing at one another in shared, horrified anticipation. Then JoJo did the unthinkable. She gave the last rose away to Chad!! We were united in our loathing and I fully suspect this will be one of our greatest bonding moments during their teen-dom. So thank you Chad. Normally my daughters prefer to bond with their friends, but we’ve become united against a common enemy! These are the bachelors JoJo should pick. #4 choice Alex. Good things come in tiny packages! #3 James Taylor. He writes poetry and bears a striking resemblance to Benedict Cumberbatch. #2 Wells. Anyone who almost barfs running a fireman relay race warms the cockles of my heart. 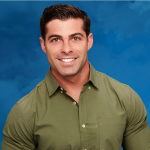 And the Winner should be: Derek! That smile, those eyes. Need I say more?